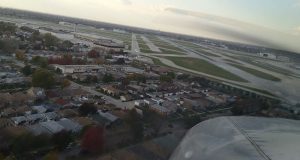 Crosswind landings are one of the more challenging skills in the private pilot curriculum. To consistently land properly in a crosswind, a pilot must understand all of the forces acting on the aircraft, and how to counter them. When flying the aircraft on final approach with a prevailing crosswind, the first thing a pilot notices is that he or she must crab the aircraft into the wind in order to maintain a ground track that aligns with the runway. Of course, the aircraft cannot land with a crab, it’s longitudinal axis must be oriented parallel to the runway before touchdown. To do otherwise would put excess stress on the aircraft’s landing gear and tires while making the aircraft difficult to control. Once the aircraft is on short final, the pilot must begin the process of correcting for the crosswind. The first step is to apply rudder align the aircraft’s longitudinal axis with the runway. Once the nose of the aircraft is pointing straight down the centerline, the aircraft will begin to drift downwind. To correct for this, use aileron to bank the aircraft into the wind. Once the pilot has corrected for drift, the combination of aileron and rudder inputs will create substantial additional drag. Again, the pilot must correct for the aerodynamic changes inherent in this new configuration. In order to maintain the proper airspeed and glide path, it will be necessary to gently apply additional power. As the aircraft enters ground effect, the surface of the earth will generate friction, reducing the effective crosswind. The pilot will need to reduce rudder slightly in order to compensate. At the same time, the pilot must reduce power and flare just as he or she would during a normal landing. The upwind wheel should touch down first, followed by the downwind wheel. The nose wheel should touch down gently after the two main wheels are on the runway. There are two other things to consider when preparing for a crosswind landing. First, you should know your aircraft’s maximum demonstrated crosswind component. This information is available in the Pilot’s Operating Handbook (POH) of all aircraft. This figure represents the best efforts of the manufacturer’s test pilot during the certification process, and not all pilots will be able to safely match this performance. Another thing to consider is a technique that will help you to land in a strong crosswind; using less than full flaps. Adding full flaps will contribute to the increased drag presented by both the rudder and aileron inputs. Full flaps will also make the aircraft more susceptible to the influence of the crosswind, requiring additional control inputs. It is for this reason that pilots will reduce flap inputs in a strong crosswind, in accordance with the aircraft’s POH. By properly correcting for crosswind conditions, private pilots can safely land their aircraft while demonstrating their knowledge of the forces involved and how to correct for them.